A dear friend and reader of Bon Appétempt recently asked me: "Do you ever cleanse?" The long answer is that I experimented (quite a bit) with dieting in my teens and early twenties, and through much trial and error, discovered that it’s not for me. Basically, dieting always had a way of making me feel deprived, and I like life (and myself) better when I don’t feel that way. What I do do, when I’m feeling like I need some sort of cleanse, is eat Japanese and Korean food. 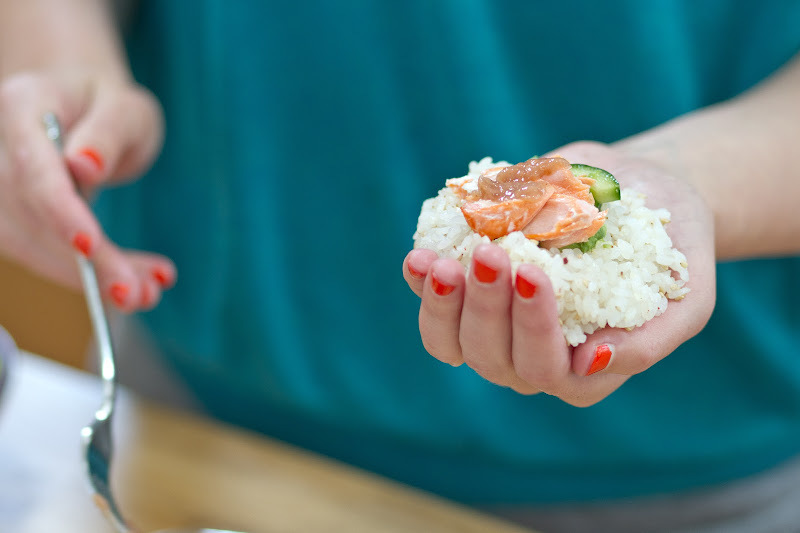 A while ago, I stumbled across a photo of Japanese rice balls (or onigiri) on Lena Corwin’s blog and made a mental note to make them. Fast forward a year and one rice-cooker purchase later, and I finally cashed in on that mental note. Of course, nothing is ever as easy as it seems. 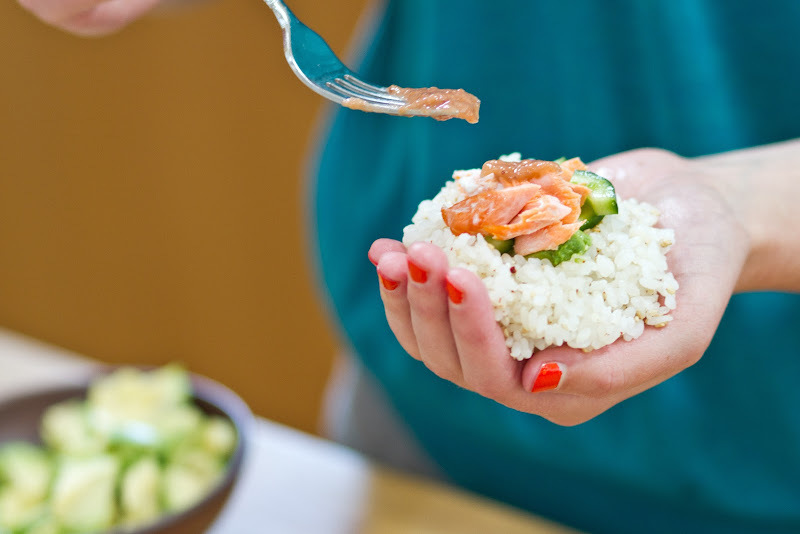 I had some trouble closing up the rice ball after having stuffed the insides with everything I wanted in there: avocado, cucumber, salmon, and a touch of umeboshi paste. So, I added more rice. Only, when I did get the thing into a ball-like shape without the insides coming out, the finished product was about the size of a grapefruit—not quite right either. The good news? Just like fallen layer cakes can become trifles, poorly put together rice balls can easily turn into delicious rice bowls. And Matt was happy because he doesn’t like salmon (Yet he does like lox? 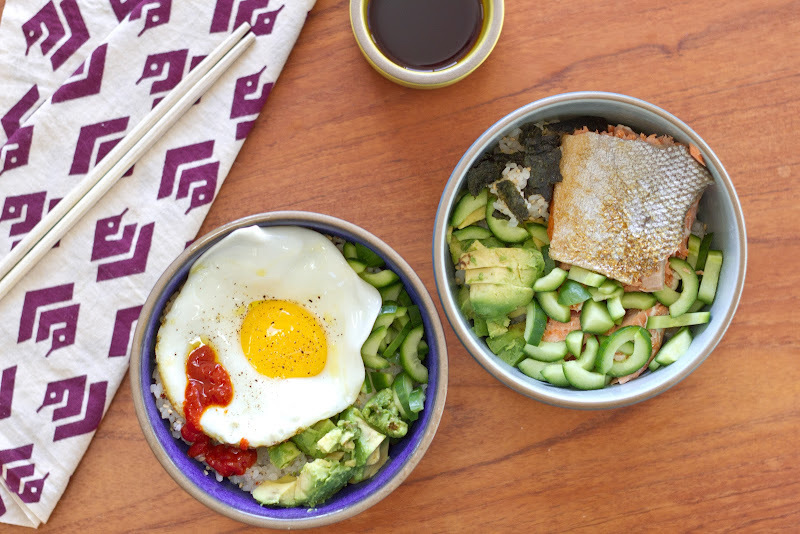 ), and this variation allowed him to top off his version with a fried egg. In related news, now I have a tub of umeboshi paste in my refrigerator, the container of which suggests trying it on an ear of corn instead of butter… I think I just might. But if you have other ideas on how to use it, I’d love to hear them. 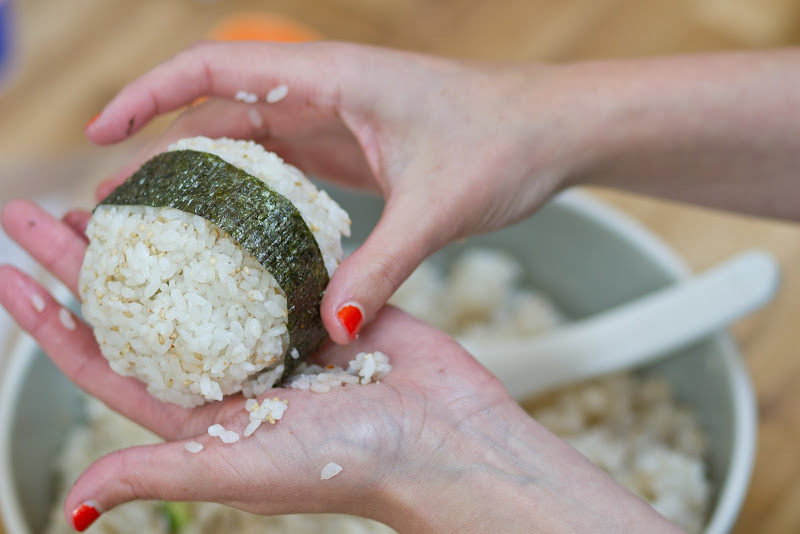 Make 2 cups of sushi rice (makes 4-8 rice balls), and let it cool down a little. In the mean time, heat up a pan or cast iron grill and add a tablespoon of vegetable oil (I used grapeseed oil). Cook the salmon. I followed Lena's lead, putting it skin side down with a top over it until almost done (5-10 mins), then flipped it for one minute further. When the rice is not hot anymore, add the sesame seeds (about a 1/2 cup), sea salt to taste, and whatever other seasoning you want (I used Korean red pepper flakes). 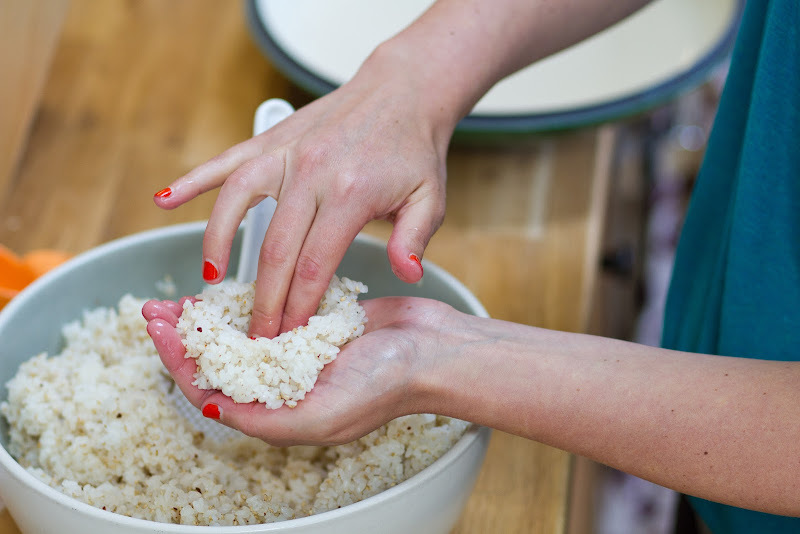 Taste the rice to see if you need to add more salt or sesame seeds. That fried egg looks amazing! I love how clean Japanese food feels. They look great! 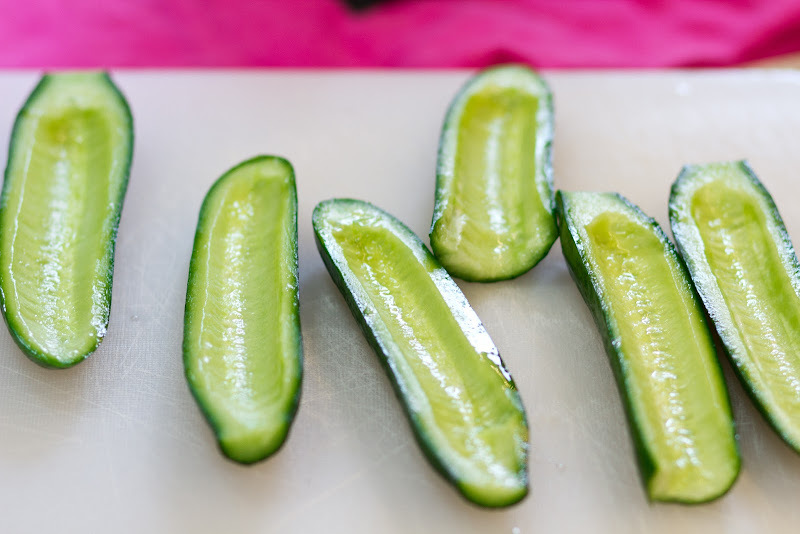 Perfect and nourishing and easy to eat on the move. 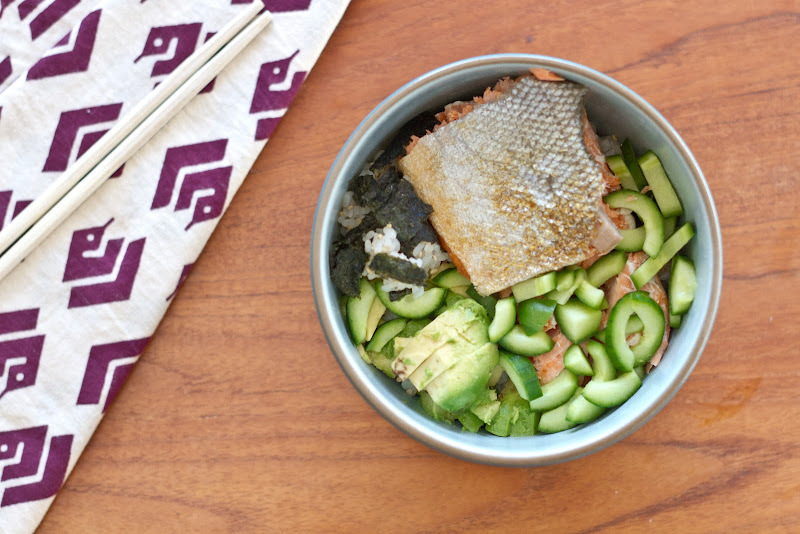 I read a book recently called Health on Your Plate that inspired me to eat more simple, whole foods, and this recipe looks like it would fit that perfectly. I'm excited to try it. Thank you! YUM! Love that fried egg! yum. i'm doing it. my matt also dislikes salmon. WHAT GIVES, MATTS OF THE WORLD? Obviously I am most obsessed with the cleanse statement in your post! That's sort of exactly how I feel (except I've been feeling a weird urge to cleanse this week) - thank you for articulating it so clearly! Also, this looks absolutely delicious. Howzabout we eat it and then head straight for the Jade Room? One of my favorite sandwiches is Camembert and umeboshi on crusty baguette. Trust me, you'll like it. Omg. that sounds amaaaaazing. Thank you!! Cannot wait to try. Ha!! Thanks for the tip!! Umeboshi is great added to homemade salad dressings - my go to used to be 1/2 cup olive oil, tsp of umeboshi or to taste, 1/4 cup tamari sauce, Tbl lemon, spoonful of honey to taste, 1 grated garlic clove, 1"grated ginger, pinch red chili flakes. Ohh so cool! I haven't been too adventurous with Japanese food--I think I've only made stir frys--but this looks like an awesomely light and delicious meal! I don't understand this question, Shell! This reminds me of Niwana! I want to go get sushi and korean food all at once with you! Just FYI. 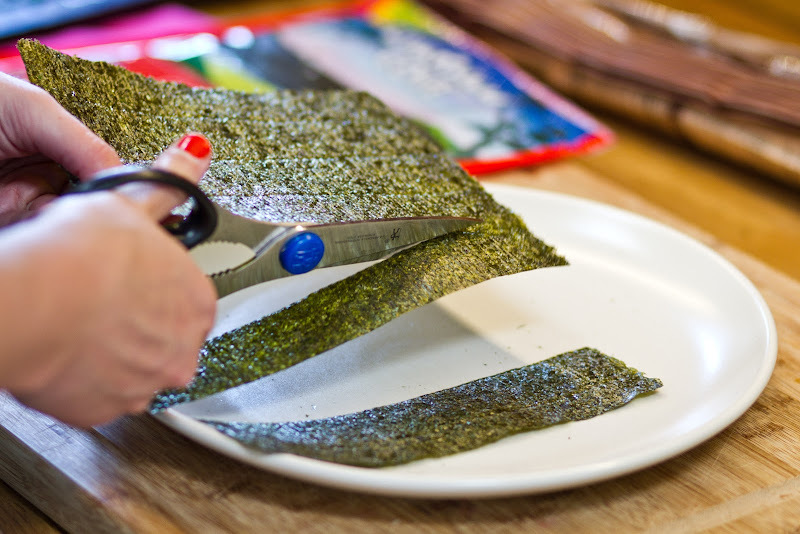 Sticky Rice is not the same as Sushi Rice. Sticky Rice is sometimes called glutinous rice and it'll form into balls very easily.